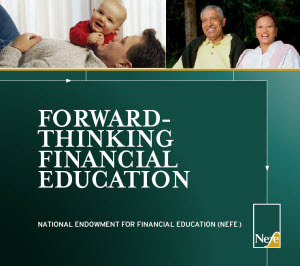 The National Endowment for Financial Education (NEFE) provides financial education and practical information to people at all financial stages. NEFE believes that regardless of background or income level more financially informed individuals are better able to take control of their circumstances, improve their quality of life, and ensure a more stable future for themselves and their families. For more than a quarter-century, NEFE has dedicated itself to the public good. We began with the NEFE High School Financial Planning Program® (HSFPP) and have since built numerous programs for consumers based on research and our expertise. All NEFE resources are available at no cost. To understand and meet the changing financial education needs of Americans, NEFE joins forces with thought leaders across the country and worldwide to help move financial capability forward. We facilitate rigorous financial literacy and behavioral research, convene experts on various personal finance topics and comment and engage in national public policy efforts. NEFE’s legacy of service continues through our unwavering commitment to providing financial education and real-world information to people at all societal levels. It is NEFE's strong conviction that, through an increased understanding of personal financial issues, all Americans can enjoy better, more secure, and more satisfying lives.